Cool, thanks I appreciate it! So with it getting closer and closer- who all is coming to Hidden Falls on the 2nd? I'll be there Saturday morning when everyone meets in B. Are you selling your cherokee Evilpopcorn? Never, Chery's been good to me. Anyone that's showing up at Hidden Falls- I'll meet you in front of that barn in B around 8:30! Big shell is also called PINS, "Padre Island National Seashore", its 60 miles of 4 wheel only beach. 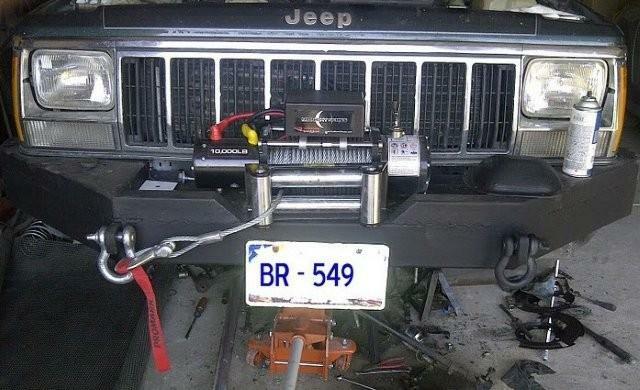 "http://www.corpusfishing.com/pinst.htm"
My jeep was down while I built a winch bumper for it. Replaced both front axle seals and install a 3" Rough Country Lift. Also installed a bored throttle body replaced the injectors with the Ford yellow injectors with a new fuel pressure regulator. I drove it Friday to get the State Inspection that had expired in June. Got back from Hidden Falls a little bit ago, no one here came out? I was hoping to see some of my fellow CherokeeForum XJ's out there! Ended up linked up with some guys from NAXJA that came out, so it was all good. Chery got several free pin stripes while I was there over the weekend. I'll be in San Antonio some time after march. I'll have to meet up with some of y'all so I can find some trails. Is there anywhere close to SA? Or is it all a drive away? Closest place I know is Cline Ranch, never been but Google says it's a one hour drive. What kind of wheeling is it? Mud, rock, trail, sand? Like I said, I've never been, always wanted to try it though.